Yeah, I Know, There Are More Important Things But I Can’t Help It, Saddam’s Hunger Strikes Are FUNNY! | HAIL DUBYUS! 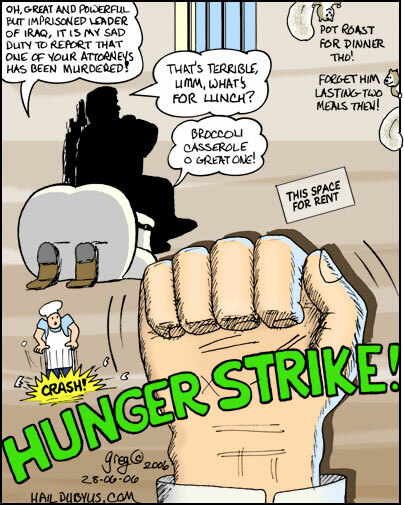 Yeah, I Know, There Are More Important Things But I Can’t Help It, Saddam’s Hunger Strikes Are FUNNY! What’s NOT funny is Saddam’s lawyers getting assassinated. According to the bush*tters in the administration, we’re bringing democracy to Iraq. One of the bases of democracy is the availability of a fair trial to ANYONE from shoplifters to child molesters to serial killers to mass murderers. Unless people who perform ghastly crimes get a fair hearing, there’s no guarantee that anyone ELSE will. YOUR right to tell a judge that you didn’t deserve the ticket for a red light because the light was obscured depends on scumbags being allowed to exercise THEIR right to declare their innocence. A lot of people say when someone’s been accused of a heinous crime: “They should just take him out and hang him.” But that’s wrong. That is not justice. It may be what they deserve. But it is not justice unless the law, the government, a jury of his peers, says that that is what should be done. And to deny that to Saddam, and to murder the people who are trying to get that fair trial for him, is a denial of any sort of true justice under democratic principles.